Search availability at 4,700+ hotels, link your Rewards and SPG accounts or read articles from Traveler - our digital magazine. Search 4,700+ hotels, see availability, get our lowest rates and filter by price or brand. Have a question? Our customer care team is available from 9 a.m. to 11 p.m. ET and typically respond within an hour. Experience cities like a local with articles from Traveler, Marriott's digital magazine. Explore articles by city or topic. Subscribe to receive articles weekly via Messenger. 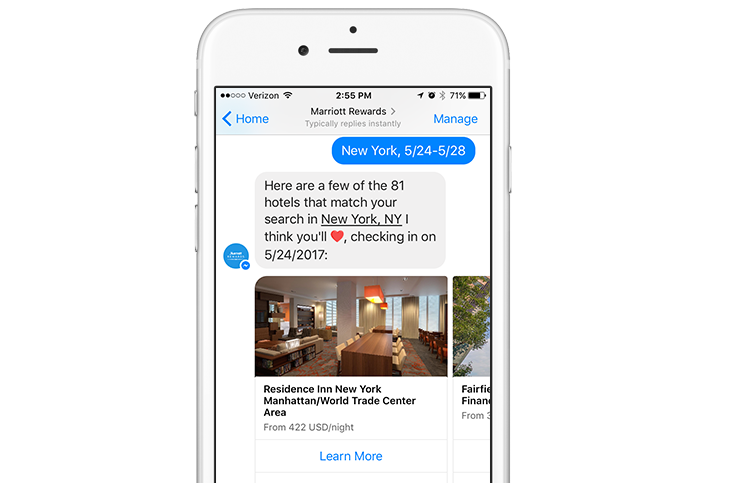 Discover Marriott Rewards on Facebook Messenger.